SimpleViewer Forum » SimpleViewer v2 » rollovers not working? i dont know if this is a Firefox issue or what, but the caption text does not show up anymore, and the cursor doesn't show a hand on any of the links. However, if you know where the link is and click it, it will work, but for a user, they will have no idea. There is a known bug whereby if captionPosition="OVERLAY_BOTTOM" or captionPosition="OVERLAY_TOP" and a caption includes an HTML line break, then any text after the line break becomes transparent. If this describes your scenario, then the workaround (until the bug is fixed in a future version) is to either use a non-overlay position for your caption or to use a single-line caption. If this does not describe your scenario, then please post a URL to your gallery so that we can take a look. just to clarify, i am currently using the free version. posted is my XML file. thanks for any help. I have used your options in a sample gallery and all seems fine (captions are displayed and rollovers work). If you continue to experience difficulties, please post the URL to your gallery so that we can take a look. Thanks for your reply Steven. I downloaded the update, as well as purchased SVPro yesterday, so i will give it a try. Steven, i updated and tried 2 browsers, Safari and FF. IN FF i dont see any of the captions at all. In Safari, i see the caption text, but no rollovers. Please post the URL to your gallery so that we can take a look. Its not live right now. I don't know if anyone else is having this problem, but when i upgraded to Flash player 11, this problem exists in 2 browsers. When i put Flash 10 player back it went away. So links don't work in flash 11? Captions and links work fine with Flash Player WIN 11,0,1,152 in Firefox 7 and Safari v5.1 on my PC. There is a caption which contains a link on the first image. Are you able to see the caption in any/all browsers and does the link work for you? looking at the sample gallery, i dont see any caption. the only thing i see is the arrow pointing to the right. 2 browsers, dont see caption. the only thing i see is the arrow pointing to the right. The thumbnail navigation arrow or the main image navigation arrow? Are the thumbnails and/or the main image itself displayed? Could you perhaps upload a screenshot somewhere to let me see what you are seeing (or not seeing). Thank you. Try deleting your Flash Player browser settings under the 'Advanced' tab of the Flash Player settings. The caption (including the link) is displayed below the thumbnail matrix in the screenshot you provided. It sounds like you may have once set galleryStyle="COMPACT" which, in SimpleViewer-Standard, places the caption in a rollover-overlay on top of the main image. Try using this setting to see if the gallery displays what you expect to see. i thought you meant a caption that would appear on the photo, which is what i thought 'caption' was. Try using what setting. Gallery style is set to 'galleryStyle="CLASSIC"
... in your gallery's XML file (instead of galleryStyle="CLASSIC"). OK-that totally works with the links, but now the pictures are cut off and cant see the entire pic. If you were to purchase SimpleViewer-Pro, you would have greater control over the customization of the gallery and you could use: captionPosition="OVERLAY_BOTTOM" (to position the captions at the bottom of the overlay on top of the main images) in conjunction with imageScaleMode="SCALE" (so that images are not cropped). I did purchase PRo, i mentioned that in post 5. OK, sorry. Your signature implies you are using svBuilder rather than svBuilder-Pro. Try using captionPosition="OVERLAY_BOTTOM" and imageScaleMode="SCALE" instead of setting a galleryStyle. sorry bout that, forgot to update sig. Just to confirm-make those changes in Pro, correct? Im actually having better luck using the free version, as far as the blank spaces Im getting. Their not there in the free version, but i cant seem to get around them in Pro. I posted a link to a screen shot. The options captionPosition and imageScaleMode are Pro options. Inlcude them in your gallery's XML file as attributes in the opening ,simpleviewergallery> tag. If your gallery uses the Pro 'svcore' folder, then these options will be used in displaying the gallery. If your gallery uses the Standard 'svcore' folder, then these options will be ignored. Im actually having better luck using the free version, as far as the blank spaces Im getting. 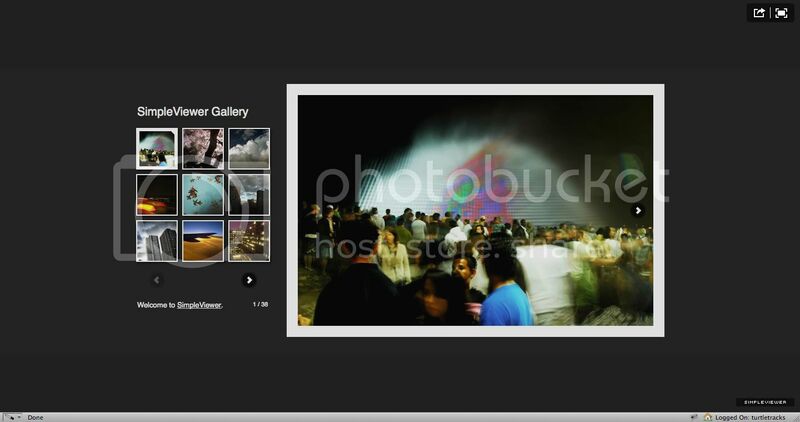 SimpleViewer-Pro provides much greater control over all aspects of gallery layout. Take a look at the SimpleViewer-Pro Layout Guide and the available SimpleViewer-Pro Config Options. I posted a link to a screen shot. Your latest post contains no link to a screenshot. I branched your new query to its own thread for you.